According to preliminary “questionable” reports circulating across the Internet, some of the world’s greatest and not-so-great musical talents are joining in Stevie Wonder‘s Florida boycott on Florida regarding the controversial “Stand Your Ground” law that may. The list floating around mentions names like the Rolling Stones, Madonna, Jay-Z, Justin Timberlake, Rod Stewart, Rihanna, Trey Songz, Mary J. Blige, Wale and Keyshia Cole. What made the list so undeniably questionable is that even in some of the more popular versions of the list (which some have been shared by 50,000 persons on Facebook) the name of the artists are sadly misspelled. That’s a serious red flag. Plus, there’s no sign of quotes or links nowhere in the photo’s descriptions, leaving room for extraordinary doubt. Here’s one of those popular “shared” photos featuring the misspelled names of artists and with no linkage. And this is how many times it’s been shared on Facebook as of 4:41 p.m., 7/22/13. From the very few resources that have been picked up on this “story,” only an article from the Washington Times (not to be confused with the more-revered Washington Post) mentions the possibilities of such a massive boycott from the music world. 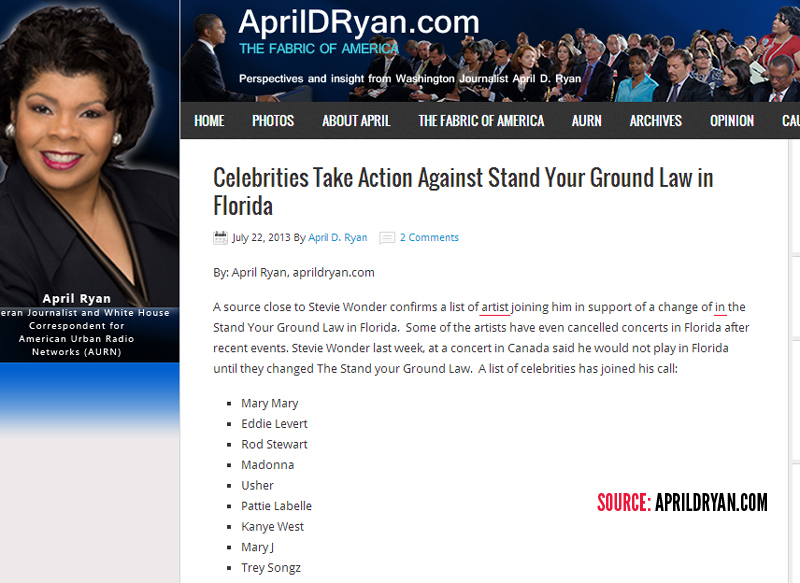 A source close to singer-songwriter Stevie Wonder has released a list of some the biggest names in the music industry joining in the boycott against Florida’s “stand your ground” laws. Artists joining Mr. Wonder reportedly include Rod Stewart, Madonna, Usher, Justin Timberlake, R. Kelly, Rihanna and Alicia Keys. 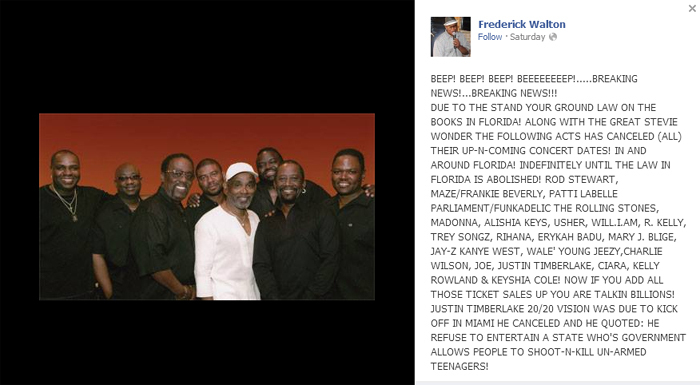 Rappers Jay-Z, Kanye West, Trey Songz, Young Jeezy and Wale also signed on to the boycott, The Hill reported. (Check the grammatical errors underlined in red below; click image to enlarge). In all seriousness, we arn’t exactly sure on what to believe right now. These artists may be in support of Stevie Wonder’s courage, but may not be ready to quit their touring regimen in Florida, and states like it. Lest we forget, Wonder’s statements echoed that he would not perform in states with similar laws as Florida’s. 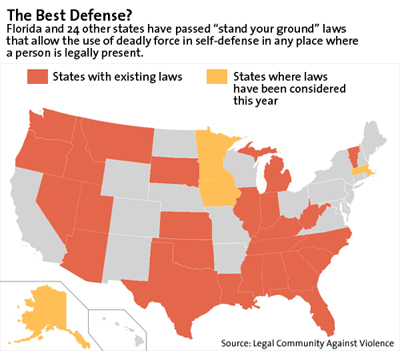 On the record, 31 states in the continental US have already adopted laws similar to the “Stand Your Ground Law” enacted in Florida. But actually could this source be leaving a major component out of this conversation? How far will they join Stevie’s protest? Are they going so far to say they will not perform in the other states bearing similar laws? Ahh, good luck on that. Stevie has enough money in the bank to retire for good – he doesn’t need to tour. Can’t say the same thing for these other artists. By the way, here’s the current road map of states with Stand Your Ground laws, mostly known as Castle doctrine. Goes to show you that everything you read online using the guise of news and journalism is not true (or confirmed). To date, the only confirmed artists to withdraw future any future concert performances in the Sunshine State have been Stevie Wonder and gospel act Mary Mary. Next time you want to get info on musical talents, don’t depend on a White House insider to find out the truth. Quick to jump on the story, Huffington Post published their version of the story, citing April Ryan’s details from the “alleged source.” As of today, their story has been shared 478 times and tweeted 82 times. Sadly, the story has been amended several times since it was originally published at 5:37 p.m. to exclude many of the mentioned names from before after HuffPo tried to reach out to their contacts, management, publicists, etc. According to their most recent updates, the Justin Timberlake/Jay-Z tour stop in Miami is still in effect, and a source connected to Rihanna has denied the singer’s participation in a boycott. Once again, there are no credible quotes from any of the artist’s publicists and management regarding their participation in a Florida concert ban. According to political watchdog site Mother Jones, no one affiliated with the Rolling Stones had heard of the boycott or the list. Since the post, April D. Ryan has spoken up about the inaccuracies of the story and believe that many of the artists now are “uncomfortable with being identified” with the protest. According to Morgan Whitaker, writer at MSNBC and blogger for PoliticsNation with Al Sharpton, a number of artists including Trey Songz and Madonna are not commenting on the story, while Rihanna’s press has confirmed that she is not joining the protest. Many of the aforementioned acts posted by Ryan have denied their involvement in such a protest.